The Efficient Markets Hypothesis is one of the most tested and most contentious theories in social sciences. A popular test of market efficiency is whether professional money managers can outperform the stock market. In a nod toward market efficiency, through November 25, about 85 percent of mutual fund managers have underperformed the stock market. The performance of actively managed mutual funds is the worst one-year performance in 30 years. The Christmas Price Index (CPI) is out and the cost of Christmas increased a mild 1 percent this year. In fact, only 4 of 12 items for my true love increased in price this year. Six geese-a-laying jumped an incredible 71.4 percent, while three French hens jumped 10 percent. However, since these make up a relatively small portion of the total index, the effect on the index inflation was small. The 1 percent increase in the CPI over the past year was the seventh smallest over the 30 years that PNC has computed the index. Days' payables outstanding is frequently used to determine if a company pays its bills slowly, yet for for some companies, months' payables outstanding may be a better measure. CFO recently discussed 45 publicly traded companies that had an average days' payables outstanding of 212.3 days. The longest had a days' payable of 585.9 days, or almost 20 months! Although the article touts a long payables period as beneficial because "the company is able to deploy cash to other uses," it is also forcing the company's suppliers to finance part of the company's operations. So far this year, investors have poured $113 billion into investment grade bond mutual funds. While such bonds appear to have a relatively low default risk in the current environment, the YTM on these bonds is close to a record low. The Federal Reserve has indicated that it plans to increase the Fed Funds rate, which will increase corporate borrowing rates as well. You should also be aware that the lower the current YTM, the greater the interest rate risk. Consider, in May and June 2013, investment grade bonds dropped five percent because of an increase in interest rates. Therefore, if interest rates do increase, investors may be in for a shock. Ford, which manufactures the best-selling F-150 pickup, is making a big bet on aluminum. The company began manufacturing F-150s today that are entirely made of aluminum. The switch will lower the weight of the pickup by about 700 pounds, increasing full economy. From a capital budgeting perspective, we appreciate that the author of the linked article accounted for the erosion of 90,000 units this year, with an associated sales figure of $3.6 billion. Apple recently offered €2.8 billion ($3.5 billion) in bonds. The bonds are equally divided between an 8-year maturity issue and a 12-year maturity issue. The notes will pay 30 basis points and 45 basis points more than the benchmark interest rate, respectively. The yields of 1.082 percent and 1.671 percent are some of the lowest in history for these maturities. The euro bond issue will allow Apple to tap into its enormous overseas cash horde and the proceeds will likely be used for dividends and share repurchases. U.S. corporate cash balances held overseas have reached $2.1 trillion, a 600 percent increase over the past 12 years. In comparison, the domestic U.S. corporate cash balance is $1.9 trillion. The major reason for the growth in international cash balances is the U.S. tax policy that taxes repatriated profits at the difference between the local tax rate already paid and the U.S. corporate tax rate, which is one of the highest in the world. Repatriating overseas cash does not necessarily mean the cash will be used for investment. One study indicates during the 2004 tax holiday, every dollar repatriated generated an $0.80 dividend payment and $0.15 share repurchase. While politicians may decry the lost corporate tax revenue that arises with a repatriation tax holiday, personal income taxes balloon with the increased dividends and share repurchases. Bowie bonds were created in 1997 when the current and future revenues of the 25 albums David Bowie recorded prior to 1990 were pooled and sold as bonds. Prudential Insurance, which purchased the entire $55 million bond issue, received a 7.9 percent coupon over the next 10 years. One advantage of such an asset is the correlation with more traditional assets, like stocks and bonds, tends to be low. Now, a marketplace exists to sell music royalties and the cash flows from other intellectual property in auctions for as low as $4,000 each. Yields on these instruments is as high as 20 percent, although we should warn you that any yield that high does entail significant risk. Since 2008, the number of female board nominees at S&P 500 companies has risen from 15 percent to 30 percent. For Russell 3000 companies, the number of female board nominees has also doubled over the same period, from 11 percent to 22 percent. Surprisingly, even with the large increase in female nominees, the number of female board members at S&P 500 companies has only risen from 16.3 percent to 18.7 percent. The increase in female board members is international as the number of female board members in Great Britain and Canada has increased as well. If we assume that the stock market is efficient, where should you invest? In an efficient market, the best alternative is likely a passive index fund. For example, funds that track the S&P 500 exactly mimic the portfolio composition of the S&P 500. Stocks are bought or sold only when changes are made to the companies included in the S&P 500. As a result, there is no management decision on which stocks to buy or sell, so management costs are small and the return of the fund will almost exactly track the S&P 500. With an actively managed fund, the manager must outperform the market in order to offset the management fees, a daunting if not impossible task in an efficient market. Eugene Fama, the Nobel prize winning father of the efficient markets hypothesis, argues that a passive investment strategy is likely the best performer. And none other than famed investor Warren Buffett has directed that most of his wealth be invested in passive index funds after his death. Stock buybacks for the first six months of 2014 have reached $338.3 billion, the largest amount in the first six months of a year since 2007. The top repurchasers so far this year are Apple ($32.9 billion), IBM ($19.5 billion), and ExxonMobil, Pfizer, and Cisco, each with more than $9 billion in repurchases. Even more amazing is that companies spent 31 percent of the cash flow generated in the second quarter on buybacks. We feel the textbook makes a compelling case that share repurchases are a more tax efficient method of paying dividends. However, critics argue that share repurchases are used to artificially boost stock prices and that management isn't investing as much as it could in the business, which will hurt long-term growth. In recent years, the yield spread for low-grade or junk bonds has been relatively low. However, recent economic and Federal Reserve indicators have led junk bond investors to demand a higher yield spread. For example, Global Management LLC recently sold eight-year junk bonds with a coupon rate of 9.25 percent. When the bonds were originally marketed, the coupon rate was 8.5 to 8.75 percent. And AK Steel Holding had to increase the coupon rate in its new bonds from 7.5 percent to 7.75 percent. For BofA Merrill Lynch, the yield spread that investors require for that company's high yield debt has increased from 3.8 percent to 4.05 percent. You may have noticed when you open the Excel Master files you have downloaded, Excel will likely open the files in "Protected Mode". The reason this happens is that Excel allows you to create macros. Macros are a program written to eliminate the need to redo common tasks. For example, you can create a macro to calculate the future value of a growing annuity, a function that is not readily available in Excel. However, in using a spreadsheet created by someone else, there is the possibility that they have written a malicious macro in to the Excel workbook. As this article explains, using the Protected Mode allows you to see everything that is coded into the workbook without allowing the workbook access to your computer, thus preventing a malicious code from being loaded onto your computer. 2014 may be the biggest year for IPOs since 2000. One big IPO, Alibaba, is expected to raise about $20 billion on its own. But other deals have hit the market this year. For example, there have been 51 biotech IPOs through September 2nd, an increase of 113 percent over 2013. As many as 40 more IPOs are expected to hit the market before the end of the year, which could bring the amount raised in 2014 IPOS to $80 billion, the second largest IPO year on record for funds raised. The decision to attend college is at least in part a capital budgeting decision. A recent report by economists at the Federal Reserve Bank of New York completed that analysis for us. The NPV of a college degree today is about $273,000, down from a high of $338,000 in 2001, but three times the 1980s NPV of $80,000. Additionally, the payback period today is about 10 years, much quicker than the 15 to 25 years during the 1970s. What about the IRR? The IRR overall for a college degree is about 15 percent. Engineers have the highest IRR at 21 percent, while education majors have the lowest IRR at about 9 percent. When Burger King announced its acquisition of Tom Hortons Inc. this week, Hortons' bondholders felt the effect as bond prices fell from 106 to 101 because of the lowered credit rating for the combined company. However, when the expected downgrade is announced, analysts believe the bond value will drop to 90 percent of par. Most of the bonds will likely be redeemed by Hortons as the bonds have a put provision that allows the bondholders to force Hortons to buy back the bonds at 101 percent of face value in the event of a takeover. While the put does protect bondholders from absorbing the full loss in value, bondholders will still experience the 5 percent drop in bond value. In Europe, Spens clauses force the company to buy back bonds closer to the market value of the bond prior to the acquisition. It appears that the SEC is close to increasing the regulations on credit-ratings agencies. Traditionally, credit ratings for bond issues have followed the "issuer pays" model, that is, the bond issuer pays the ratings agency fee. This arrangement can lead to a conflict of interest as a credit-ratings agency that awards low ratings could lose business in the future. The new rules are designed to "take additional steps to ensure that the firms’ interest in winning business doesn’t affect ratings analysis." Additionally, the new regulations require more disclosures to investors, never a bad outcome. Last week we published a post about recent share buybacks. In that post, the article we referenced noted that the 100 stocks with the biggest buybacks had outperformed the S&P 500 by 10 percentage points in 2013, but trailed the S&P 500 by about 1 percent in the first quarter of 2014. As we like to caution our students - Be careful of numbers. A more recent article about share buybacks notes that the top 100 repurchasers have outperformed the S&P 500 by about 1 percent so far this year, a reversal from the previous article. So, while the companies with the largest buybacks didn't outperform the S&P 500 in the first quarter of 2014, they did in the second quarter. While this is interesting, the more important point for you going forward is to critically examine historical numbers. Just because something happened in the past does not mean that it will occur in the future, or, in this case, just because a past relationship doesn't hold during a specific time period doesn't mean that that relationship won't continue in the future. In short, a sense of skepticism is a healthy thing when dealing with historical numbers. By now you are aware of the benefits of diversification. As this article states "you don’t diversify to gain the highest returns. You do so to ensure you don’t get the lowest." An important part of diversification that you should be aware of is rebalancing. Suppose that you decide you want a portfolio that has 70 percent stocks and 30 percent bonds. Since stocks generally have a higher return than bonds, over time, your portfolio weights will gradually shift more heavily toward stocks. Because of this, you should rebalance your portfolio periodically. In other words, you should sell some of the better performing asset and buy the other asset in order to return the portfolio weights to 70/30, your original allocation. In the first quarter of 2014, S&P 500 companies repurchased about $160 billion of their own shares. Companies may be motivated to repurchase shares because of slow domestic growth, which can make share repurchases an attractive alternative for corporations. Another motivation mentioned in the article is that share repurchases may be used to readjust a company's capital structure. In the past several years, the stock market has increased in value, which has likely increased the equity weight of a company's capital structure. As a result, a company's capital structure may be too heavily tilted toward equity. A share repurchase can reduce the equity, thus restoring the capital structure to the optimal level. A point about share repurchases addressed in the article that is particularly near and dear to us is research that finds companies are not particularly good investors. In fact, companies tend to undertake repurchases when company stock valuation is at a peak instead of when company stock is undervalued. One reason for this contradiction may be that as company performance increases, cash held by the company increases, as well as the stock price. As a result, companies have cash available when its stock price is high, which is the worst time to buy stock. In the textbook, we argued that stock splits appear to have no value to either shareholders or corporations. However, it appears that our analysis may be incorrect and there could well be an important advantage from stock splits that accrues to management. Steve Ballmer's $2 billion bid for the Los Angeles Clippers shocked many people. Leaked court documents show why. Ballmer's bid was 12.1 times revenues (Price/sales ratio). For the last 25 NBA teams that were sold, only four have sold at a ratio above 4.0, and none had a ratio above 5.0. Similarly, the $2 billion bid price implies an EBITDA multiple of 12.1 times, while the league average has been 6.0 to 6.4 times EBITDA. All in all, it appears that Ballmer is willing to pay a high price for the Clippers, at least relative to revenue and EBITDA. Even though we discussed the most recent Big Mac Index yesterday, this article caught our eye. As you will see, the article discusses how the valuation of the dollar has changed over the past several years based on the price of Big Macs. For example, the average value of a basket of foreign currencies against the U.S dollar was about neutral in 2009. Based on the recent Big Mac Index, foreign currencies are about 15 percent undervalued against the dollar now. Several currencies have had wild fluctuations, including the euro, which was as much as 50 percent overvalued in 2008 and is now about fair value, and the yen, which has gone from fair value to 24 percent undervalued. The 2014 Big Mac Index at The Economist is out and the average price of a Big Mac in the U.S. is $4.80. Norway has the most expensive Big Mac at $7.76 and the Ukraine has the cheapest Big Mac at $1.63. According to the Big Mac Index, five currencies are overvalued relative to the U.S. dollar by ay least 10 percent and 29 currencies are undervalued by at least 10 percent. Remember, the Big Mac Index is based off absolute purchasing power, which may not hold. For a video explanation of purchasing power parity, check out this video at Yahoo! Finance. CFO just published the 2014 working capital survey by REL Consulting. The report indicates that the average days working capital decreased only .2 days over the past year. REL's analysis indicates that the 1,000 large U.S. companies included in the survey could reduce payables and receivables by $266 billion and $331 billion, respectively. While efficiency in short-term financial operations will help profitability, the lack of improvement in working capital management in recent years is likely due to the low interest rate environment. Some of the better performers in day's working capital outstanding include Murphy Oil (negative 60 days), Linn Energy (negative 50 days), Anadarko Petroleum (negative 45 days), and Dell (negative 23 days). U.S. pharmacuetical company AbbVie announced that Shire Plc has agreed to be acquired for about $54.7 billion. For AbbVie, the acquisition gives the company Shire's portfolio of expensive medicines, which is needed since AbbVie's Humira, the world's best-selling prescription, loses patent protection in 2016. With any acquisition, you would expect synergies, however, the most important synergy for AbbVie may be that the acquisition will allow the company to relocate to Ireland, which could reduce its tax bill from 22 percent to 13 percent. Capital expenditures fell by three percent in the first quarter of 2014, to an annualized value of $1.8 trillion. With the lower capital expenditures, the financing gap (think external financing needed) was a negative $77.4 billion, the 21st consecutive negative quarter. U.S. nonfinancial companies issued $4.873 trillion in new debt during the quarter and spent about one-half of that repurchasing equity. While you have done a great job with your data analysis, a chart or graph is often the best way to convey the information. And while we think Excel Master does a good job introducing you to Excel's charting capabilities, for more on creating charts and graphs in Excel, check out this article from PCWorld. The Bank of America Merrill Lynch Global High Yield Index began in 1997 and 12 years later, the value of junk bonds in the index reached $1 trillion. In the last four years, another $1 trillion has been added. During 2013, a record $477 billion in junk bonds were issued, and, so far this year, $338 billion in junk bonds have been issued. A major factor that is causing the rapid increase in junk bond issuance is the "reach-for-yield," that is, investors are looking for a yield on debt in the near zero government bond environment. Additionally, Moody's measure of the the strength of junk bond covenants is the weakest since the company began tracking covenants in 2011. A recent article in CFO states that schedules on capital budgeting projects are missed by an average of 55 percent and budgets are missed by 33 percent. One potential problem for capital budgeting is that most projects are evaluated by project advocates within the company, who are often biased in favor of the project. For example, a financial services company found that the initial cost projections for its projects were off by a factor of 2.37, meaning that for every dollar originally projected to begin the project, it actually cost $2.37. A second problem is that small and large projects are evaluated the same way, especially in regards to timing. For example, consider you and three friends are going to dinner together, each from a different starting location. Each of you has a 50 percent probability of arriving on time. What is the probability that you will all arrive on time for dinner? While you might think that it is 50 percent, it is actually 6.25 percent (.50 × .50 × .50 × .50)! In a large project, with intermediate tasks that are dependent on preceding tasks, it is easy to get behind schedule very quickly. Cupcake company Crumbs announced that it would file a Chapter 7 liquidation. Crumbs, which was founded in 2003 and went public in 2011, had 65 stores in 12 states. The company sold cupcakes in flavors such as Cookie Dough and Girl Scout Thin Mint. For the first quarter of 2014, the company lost $3.8 million, a sharp increase from the 2013 first quarter loss of $2 million. The U.S corporate tax code is a hot button issue, with some arguing for higher tax rates and others arguing for lower tax rates. No matter which side you fall, one thing is certain: Companies have left the U.S. for countries with lower tax rates. For example, Medtronic recently announced plans to purchase Covidien and move the company's operations to Ireland. While the official top marginal tax rate in the U.S. is 35 percent, a recent study by S&P indicates that the effective corporate tax rate for the U.S. in 2012 was 32.3 percent. By way of comparison, the effective tax rate in Switzerland is 22.4 percent, in the U.K. it is 26.4 percent, and in Spain it is 26.5 percent. There is another interesting statistic in the article that we want to make sure that you didn't overlook. Overseas revenues now account for about 48 percent of all revenue earned by S&P 500 companies. 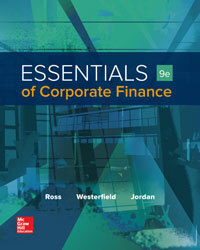 Much of the material that you will learn in this textbook is applicable to your own investment strategy as well. A recent article on CNBC highlights a couple of these lessons. As you will read, the article discusses the problems faced by a couple in their attempt to become landlords. We would like to point out two sentences near the end of the article. First, "Without leverage, the most you can lose is your initial investment. With leverage, you can lose substantially more than your initial investment." As we have discussed, leverage is a double edged sword that can increase returns when times are good and decrease returns when times are bad. As an equity investor in a company, you are protected from losing more than your initial investment in the company. However, when you use leverage for personal investments such as purchasing a rental home with a mortgage or borrowing for a stock investment, you can lose more than your initial investment and your entire wealth can be at risk. The second statement we would like to point out is "Owning more of a good thing is not always better. Concentrating is gambling; diversifying is investing." Hopefully you are well aware of the benefits of diversification by now. A concentrated portfolio can make you wealthy if you hit it lucky, however, it can also break you if things go poorly. For investing in the future, we believe the same as the author of this article: For most people, a diversified portfolio is a much better strategy to achieving personal investment goals. The conversion of U.S. corporate accounting from GAAP to International Financial Reporting Standards (IFRS) has been in process for several years. However, in a recent speech, former SEC chair Christopher Cox stated he had come to "bury IFRS, not praise them." Cox argued that the lack of progress in adoption of IFRS standards over the past six years has weakened enthusiasm for conversion to IFRS in the U.S. During Cox's last year as SEC chair, the process for converting U.S. financial standards to IFRS by 2014 was outlined. However, subsequent SEC chairs have not followed through on the conversion. IASB chair Hans Hoogervorst disagreed with Cox, arguing that the recent adoption of lease accounting changes is an indication that IASB and FASB standards are becoming more similar. China's corporate sector has become riskier in recent years, with declining corporate cash flows. Even with the increased risk, China is now the largest issuer of corporate debt, with $14.2 trillion outstanding at the end of last year. By comparison, U.S. companies had $13.1 trillion in debt outstanding. S&P estimates that one-fourth to one-third of Chinese corporate debt is loaned by shadow banks, financial intermediaries that provide services similar to traditional banks, but not tied to banking regulations. One risk of shadow banking is that lending in this segment can contract much more quickly than in the regulated banking segment. By 2018, it is estimated that Chinese corporate debt will increase to $20 trillion. Saving money does not pay in Europe. The European Central Bank (ECB) recently lowered borrowing and savings rates. In fact, the ECB lowered the rate paid on regional bank deposits to a negative .1 percent! By lowering interest rates, the ECB is hoping to stimulate spending and inflation, which is about .5 percent in euroland. So, how do you calculate the real interest rate with a negative nominal return? In this case, the real rate is approximately negative .6 percent. As the quote often attributed to Mark Twain goes "It is difficult to make predictions, especially about the future." Nowhere is this statement more relevant than making predictions about the stock market. In a recent discussion of future stock market returns, a 12 percent market return going forward was proposed. What is more dangerous is that an 8 percent withdrawal rate for a retirement portfolio was suggested. You already know that the roughly 12 percent arithmetic average since 1926 overstates the average return for a longer period because a weighted arithmetic/geometric average using Blume's formula is more appropriate for longer horizons. We should also point out the danger of withdrawing funds. Suppose you started withdrawing 8 percent of your initial portfolio value in 2008, when the market lost about 37 percent. At the end of the year, you only have about 55 percent of your original portfolio left, so you have much less money left to go up with a good market return. Research indicates that a withdrawal of 3 to 5 percent of the initial portfolio value is much more likely to support your retirement withdrawals, even with a 12 percent arithmetic average market. We would also like to ask you a trivia question: When did the S&P 500 begin? Although you may think 1926 since that is the beginning of the data used in the textbook, Ibbotson and Associates create a proxy for the S&P 500 back to that date. Actually, the S&P 500 was launched on March 4, 1957. Proxy filings for many major U.S. corporations occur in the spring, which means the top earning CEO list comes out. Larry Ellison, CEO of Oracle, again heads the list, earning $78.4 million during 2013. However, Salesforce CEO Mark Benioff may have been paid more by some measures. Benioff's 2013 pay of $31.3 million puts him as the 8th highest paid CEO, but Benioff's compensation was a staggering 57 percent of Salesforce's cash flow and over 12 percent of sales. And Facebook paid out 11 percent of sales and 20 percent of cash flow. By any measure, these pay packages seem to be an extraordinarily high percentage of sales and cash flow. Bank of America (BAC) announced that it would halt plans to buy back its stock and would not increase its dividend. The change was because BAC found an accounting mistake that reduced its capital by $4 billion. Because of banking regulations, BAC has to receive approval from the Fed to increase dividends or repurchase stock. In a previous attempt to increase dividends, the Fed miscalculated BAC's capital. As you would expect, the news affected the stock price, with a drop of over 6 percent on the day. Are You A Better Investor Than A 6th Grader? A 6th grade class from Fargo, North Dakota, recently trounced the competitors in a stock picking competition that included groups from major universities. The students' portfolio included many companies that were familiar to them, including Netflix, Starbucks, and Under Armour. The 6th graders' portfolio had a return of 22 percent since creation, outpacing the McIntire Investment Institute's 18.5 percent return. Maybe these students will be the future Warren Buffett or Peter Lynch. Then again, as one student said, "I think it was sheer luck." At the end of 2013, nonfinancial U.S. corporations held $1.64 trillion in cash, a 12 percent increase from 2012. Apple's cash hoard reached $158.8 billion, or about 9.7 percent of all corporate cash assets. Additionally, U.S. based multinationals have $1.95 trillion outside of the country. Much of the increase in international cash balances was driven by Microsoft, Apple, and IBM. Prudential recently announced that with profit payments, its policyholders in the United Kingdom who had contributed £50 per month for 25 years would receive £31,438. A quick calculation shows that the annual return on this investment was an APR of 5.36 percent. By now, you should a small difference in interest rates can result in a large difference in future values because of the effect of compounding. For example, a similar policy with Aviva had an ending balance of £28,869, an APR of 4.79 percent. So, over this period, a difference of .57 percent per year resulted in a difference in the future value of £2,569. Policies by Standard Life, with an ending balance of £27,304 returned 4.41 percent, and Scottish Widows policies returned £25,842, or 4.04 percent. Investors are watching dividend announcements closely during February. Although a company can increase or decrease a dividend at any time, February is a popular month for dividend announcements since it is often when the previous year's final earnings are announced. Last year, February saw 78 dividend increases by S&P 500 companies. So far this February, there have been 28 dividend increases announced. Howard Silverblatt, senior index analyst at S&P Dow Jones Indices, expects that dividends paid by S&P 500 companies will reach $319 billion in 2014, topping the $312 billion in dividends paid during 2013. Is The IPO Market Booming? Our guest blogger today is Dr. Jay Ritter, renowned IPO researcher. Professor Ritter is the Cordell Professor of Finance at the University of Florida and has published more than 30 papers regarding equity issuance. Below, Dr. Ritter updates his previous post on the current IPO market. 2013 saw more initial public offerings (IPOs) in the U.S. than in any year since 2007, and the financial press has been full of stories about the booming IPO market. IPO volume tends to fall in bear markets and rise in bull markets. In the United States in 1980-2000, an average of 302 operating companies went public each year. Since then, volume has been much lower. Indeed, even with the S&P 500 increasing by 30% in 2013, only 156 operating companies went public last year. The low level of IPO activity compared with the 1980s and 1990s has frequently been attributed to a changed regulatory environment, with the Sarbanes-Oxley Act of 2002 being singled out for increasing the costs of being publicly traded. The Jumpstart Our Business Startups (JOBS) Act of 2012 reduces some of these burdens, especially for Emerging Growth Companies, defined as companies with less than $1 billion in annual revenue that have recently gone public. In “Where Have All the IPOs Gone?”, which will be published in the Journal of Financial and Quantitative Analysis, Xiaohui Gao, Zhongyan Zhu, and I present an alternative explanation for the prolonged low level of small company IPO activity that has existed since 2000. We posit that there has been a structural change whereby getting big fast is more important than it used to be, especially for technology firms. We argue that organic growth (that is, internal growth) takes too long for a company with a hot new technology. Rather than going public and remaining as an independent firm, the company finds that its value-maximizing strategy is to sell out in a trade sale. The acquiring firm is willing to pay top dollar because it can create more value by rapidly integrating the new technology into its existing products, generating greater sales because it can certify the product with its brand name and use an extant marketing organization, rather than needing to hire new employees to expand. People frequently think of an IPO as part of the life-cycle of a successful firm founded by an entrepreneur, with the IPO being both a capital-raising event and a “liquidity event” that occurs once a firm has achieved a critical level of scale. In the 1980s and 1990s in the U.S., this framework was very descriptive of actual practice for many entrepreneurial firms. Since the tech-stock bubble burst in 2000, however, this framework is increasingly at odds with practice. Instead, venture capitalists have been operating with a “build to sell” model in which they exit from an investment in a successful portfolio firm via a trade sale, in which the entrepreneurial firm sells out to a larger firm in the same or a related industry, rather than remaining independent. In other words, the traditional life-cycle for a successful technology change has permanently changed. CVS Caremark, operator of CVS stores, announced that it would no longer sell cigarettes in its stores. The company estimates that it will lose $2 billion in annual revenue and six to nine cents per share in EPS. In addition to the lost sales from cigarettes, CVS will lose sales of other items that cigarette purchasers would buy at the store. The decision by CVS is likely part of a larger move as pharmacies are trying to become health care providers. The company's stock dropped about 1.8 percent, although it did recover some. As one analyst put it "Good for them that they're taking a stand, and I'm selling my CVS stock." The statement made by CVS indicates the company made the decision for ethical and health reasons. That raises the question of how far CVS will go. While we are not stating that cigarettes are good for you, one article discusses five other items that CVS sells that are unhealthy. For example, CVS still sells soda (or pop as it is more accurately known by Northerners.) Recent studies have found that soda increases the risk of diabetes by 22 percent and the risk of cardiovascular disease by a third. So, should investors be concerned that CVS will state that the ethical standards of the company are such that it will stop selling these other items as well? Seahawks Win Good For The Market? The Super Bowl indicator is a stock market indicator which holds that if an NFC team wins the Super Bowl, the market will be up for the year and if an AFC teams wins, the market will fall. However, some argue that an original NFL team must win for the indicator to indicate an up year. This year, if the Denver Broncos had won, it might have been a good sign since the previous two times they won the Super Bowl the market was up 28 and 15 percent. In any case, the Seattle Seahawks won in a rout, so we will have to wait until the end of the year to see if the indicator is based on an NFC team winning or an original NFL team winning. Of course, if this really is your investment strategy, we would suggest rereading Chapter 11. - Paying pension funds at a rate of 45 to 50 cents on the dollar. - Paying retiree healthcare liabilities at 13 cents on the dollar. - Paying $1.4 billion of loans made to fund the pension fund at 20 cents on the dollar. - Limited-tax bondholders would receive 28 cents on the dollar. If the plan is permitted by the bankruptcy judge, future municipal bondholders will likely demand a higher interest rate since they would effectively be classified as subordinated creditors. Mortgage-backed securities were given much of the blame for the recent financial crisis. As a result of the financial crisis, home prices dropped dramatically in many areas of the country and homeowners who had their homes foreclosed were forced to rent. Because of these conditions, some investors have found an opportunity by buying houses at reduced prices and renting those houses. For example, Blackstone Group LP has spent more than $7.8 billion on 41,000 homes. To fund the house buying, bonds backed by the rental income from the houses are now being sold and could reach $30 billion per year. Because of the rapid growth in the market and fears of a repeat of mortgage-backed bond problems, at least one California Congressman has requested that the Financial Services Committee hold hearings on these bonds. A recent article in the Los Angeles Times has brought company owned life insurance (COLI) back into the limelight. COLI, or dead peasant insurance, occurs when a company buys life insurance on an employee, typically a rank-and-file employee. When the employee dies, the company receives the death benefit from the insurance. In this case, the LA Times took exception when its competitor, the Orange County Register, asked its employees to agree to these life insurance policies, with the death benefit being used to partially fund the company's pension fund. Ethical questions may arise when these policies are issued. For example, if a company has a COLI policy on an employee, perhaps the company will be more willing to scrimp on safety protocols. While some argue that COLI policies are unethical, very few argue that key person life insurance is unethical. A key person policy is a company owned policy on a key employee such as a CEO, whose death would impact the company in a negative manner. Exxon Mobil and Royal Dutch Shell both announced earnings today. For Exxon Mobil, quarterly profits were down 16 percent and annual profits were down 27 percent. The company discussed projects that were expected to be online in the next two years, which it believes will increase earnings in future years. Royal Dutch Shell announced that its earnings were down 48 percent for the quarter and 23 percent for the year. Shell also announced that it would sell $15 billion in assets over the next two years. You would think that the news was equally bad for both companies, but perhaps Exxon's focus on new projects would benefit the company's stock. Instead, Exxon Mobil stock dropped 1.18 percent on the day, while Royal Dutch Shell stock increased 1.13 percent. While all of the numbers in a capital budgeting analysis are projections, you would expect that the projections for the initial cost would be fairly accurate, but that is not always the case. For example, the Kashagan oil field in Kazahkstan is the world's largest oil discovery in 30 years. A group led by Exxon Mobil, Royal Dutch Shell, and Total have been involved in developing the project, at a budget of $10 billion. However, the cost of the project is now at least $50 billion. Similarly, Chevron started the Gorgon LNG plan in Australia with a budget of $20 billion. The cost of that project is now $54 billion. Remember, all cash flows for a project under consideration are projections. This is one reason scenario analysis is so important because it permits us to examine what can happen if we are wrong. When a company files an IPO, the prospectus is designed to inform potential investors about the company. A Hong Kong nightclub named Magnum has filed an IPO to raise $16 million and we are sure there will be a loud price pop. The IPO is 3,000 times oversubscribed, meaning investors are willing to buy 3,000 more shares than are being offered. The prospectus is an interesting read, if for nothing other than the description of clubbing as "Clubbing is a popular night time activity which has evolved from the discotheques of the 1970s into a modern form of social gathering with lively music, elaborate lighting and a dance floor, supplemented by both alcoholic and non-alcoholic beverages." Of course, the prospectus goes on to describe the risks of the investments, including the fact that "There has been a trend of 'club-hopping' developing in Hong Kong in recent years which means customers have the tendency to visit multiple clubs in one night." Of course, don't forget the risk that revenue comes from sales “generally known as alcoholic beverages served by glass and prepared by bartenders mixing different alcohol and ingredients.” If you are so inclined, have a glance at the prospectus, but be warned: It is 378 pages long! While we greatly respect Warren Buffett as an investor, we are disappointed at his time value of money skills. Buffett's Berkshire Hathaway has agreed to insure a reported $1 billion prize given to anyone who correctly predicts a perfect bracket in this year's NCAA March Madness. If you win, you don't get the $1 billion now, but rather $25 million per year for 40 years. If you want a lump sum, you would receive $500 million today. We would expect that the Oracle of Omaha would know that advertising the total annuity payments as the value of the annuity winnings is misleading, even though state sponsored lotteries use the same deception. For the record, see if you don't agree that the choices offered you result in an interest rate of 3.93 percent. And while we wouldn't turn down the $500 million and encourage you to enter since the entry is free, the odds of winning are 1 in 9.2 quintillion. GE had promised an increase in its profit margin and an increase in overall profits for 2013. The company did increase its profit margin, although it did not meet its target increase, but profits were aided by a tax gain of $1 billion. During the 4th quarter of 2013, GE Capital sold its Swiss operations, which generated the $1 billion tax credit. During 2013, GE Capital's tax rate was negative 14 percent. While we like the idea of negative taxes, the only way to achieve this dubious distinction is to lose money, which GE did on the sale of its Swiss operations. French auto maker Peugeot announced a 3 billion euro ($4.1 billion) capital increase. Dongfeng, Peugot's Chinese partner, will put up 750 million euros, the French government will put up 750 million euros, and the company will have a rights issue for an additional 1.4 billion euros. Peugeot needs the additional equity to fund new models and expand into new markets. Because the new shares will be sold at a discount and dilute existing shares, you would expect a stock price reaction. Indeed, you are correct as Peugeot's stock price dropped 11 percent. BP has two recently announced stock buyback programs, one for $8 billion and one for the "bulk" of the $10 billion it received from an asset sale. During the 3rd quarter of 2013, BP bought back 14 million shares a week, stepping that up to 22 million shares a week in the fourth quarter. So far this year, BP has been buying back an average of 37 million shares per week. With about 3.14 billion shares outstanding, BP would buy back all of its outstanding stock in about 85 weeks, although we doubt the buyback will reach that level. A recent report using results from 78 companies that do business abroad and quantified currency losses showed that these companies lost a combined $4.18 billion during the third quarter of 2013. The currencies that most affected earnings were the Japanese yen, Australian dollar, euro, and Indian rupee. Although that sounds bad, the reported loss in earnings during the 3rd quarter of 2012 due to currency fluctuations was $22.73 billion. The average loss in EPS by companies reporting currency losses was $.03. Securitization, the process of pooling different types of debt into bonds that have payments backed by the debt, is on the rise. Mortgage backed securities (MBS) and collateralized debt obligations (CDO) were blamed in part for the 2008 financial meltdown. In 2013, about $800 million of securitized debt was issued worldwide (excluding residential mortgages). Although a dramatic increase from the $200 million or so issued in 2009 and 2010, the total is far short of the more than $2.5 trillion issued in 2005 and 2006. Although regulators often argued about the evils of securitized debt, it also allows the market to pump lending into the system, which could help increase economic growth. We argued in the textbook that an efficient market reacts rapidly to new information. So how fast does the market react? Pretty quickly according to traders. Dow Jones & Co., publisher of The Wall Street Journal, announced a lawsuit against Ransquawk, a service that "scrapes" articles published online by Dow Jones and others and immediately squawks the news to its subscribers. According to Ransquawk, 8 of the largest 10 banks it the world use the service. Dow Jones argues that Ransquawk is misappropriating "hot news," an action that is not permitted under a 1918 Supreme Court ruling. Given that Ransquawk is a fee-based service, we must assume the banks using the service believe that the extra few seconds gained in hearing about the news is worth the price of the service. The American Petroleum Institute recently released projected capital spending on oil and natural gas projects in the U.S. through 2020 and the numbers are staggering. During 2014, an estimated $87.4 billion will be spent in the U.S., with spending declining to $75.0 billion in 2020. During the next seven years, a projected $568.4 billion will be spent on U.S. oil and natural gas projects. With the dollar amount being invested, we hope a careful capital budgeting analysis is being performed on these projects. Starting January 1st, companies face new regulations about whether spending on fixed assets is an expense or capitalized, which means the spending is depreciated over time. As with any other regulation, there are loopholes. For example, companies with audited financial statements can deduct $5,000 per invoice. This means an audited company could order 10 new computers at $4,900 each on 10 separate invoices and deduct the expense immediately. If the company made the same purchase on one invoice, the $49,000 would be capitalized and depreciated. Remember, while depreciation itself is not a cash flow, it does create important tax shield cash flows that we must take into account in capital budgeting.